Receiving praise for your music is one of the most satisfying things about being a musician. But when such praise is given by one of the world’s most iconic guitarists, from one of the world’s most iconic bands, there is no doubt Du Bellows are to be taken seriously. Personally I would have these words on an enormous gold plaque and mounted for every gig, but thankfully Du Bellows have more artistic humility. Since their formation in 2011, Du Bellows have been honing their sound through a rigorous gigging schedule in London. During this time they have crafted a unique musical identity, which they describe as ‘lyrical, psychedelic, progressive rock n’ roll.’ The band consists of Jade Williams (Lead Vocals/ Auto Harp), Richard Leeds (Bass/ Backing Vocals) David Watkinson (Drums) and TJ Shipton (Guitars, who has sadly left the band this February…watch this space). Without a doubt there is an air of confidence in their music, driven passionately by the impressive vocal and harmony lines penned by Williams. Their four track EP released in 2013 entitled ‘Stir Studio Sessions,’ produced by Paul Durrant (Manic Street Preachers, Stereophonics), gives the listener a small taste of what this band is about. The opening track ‘Isa Du Bellow’ would not be out of place at a sunset campfire, but soon builds pace into a more country-esque upbeat feeling. The next track ‘Spin’ emits nuances of Stevie Nicks and Rumours era Fleetwood Mac, but maintains its progressive feel. TJ’s guitar lines establish a good balance of adept technique and tastefulness behind the vocals. Next ‘Otherside’, which sustains the familiar, yet unpredictable feel of Du Bellow’s sound rooted in more traditional blues. But personally their EP shows its true colours in the final track ‘Dry Flowers.’ It’s easily the EP’s most distinctive track, hooking you in the opening guitar riff and carrying you along until the song’s gradual dynamic climax. 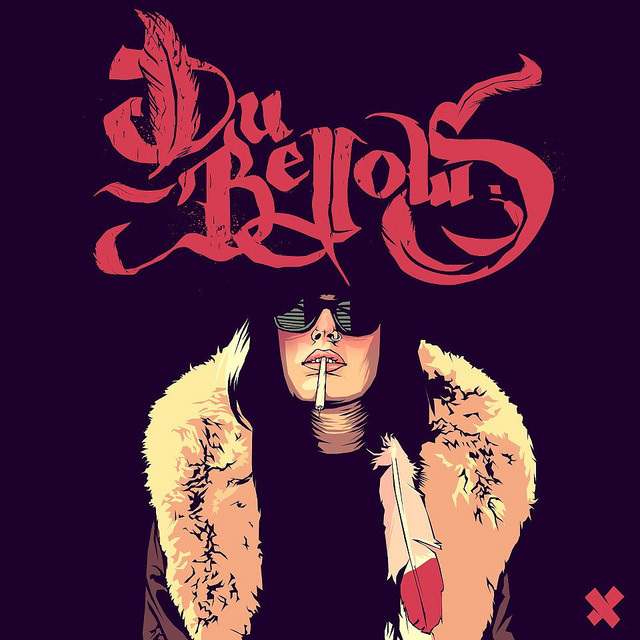 More recently Du Bellows have announced the release of their next self-entitled EP, due for release in the coming year. After generous fan support following a successful Kickstarter program, the band is now collaborating with legendary producer Chris Kimsey (The Rolling Stones, Peter Frampton, Emerson Lake and Palmer) at Olympic Studios in London. After watching them perform a sold out show in the studios last year, Kimsey has taken them under his wing, already shaping their sound in a new direction. According to lead vocalist Williams, the recording of their music is now more focused around her vocals than previously, which is different as she’d ‘never had someone form the sound around [her] before.’ The first single from the EP ‘Black Wolf,’ (perhaps a tip of the hat to Mr Page?) is nothing short of bold, feeling more spacious, capturing a newfound sense of energy in the band’s music. Du Bellows say they must ‘be seen live to [to be] truly experience[d]’. Du Bellows are due to tour Europe this year and next play at The Groucho in London on February 27th, followed by The Hospital on March 1st. Look out for their EP over the next year.